As the sun sets slowly on another week of 15 minute snippets hosted by Kate, I had another productive stint in the sewing department. I feel like I'm in control and this finishing projects stuff isn't just a pipe dream. By next week I may be a gibbering mess in the corner cursing my stupidity but I'm living large this week. I've decided not to be all show off and "look at me" this week with my 15 minute achievements. Nobody likes a braggart and I'm trying to get to 200 readers so I can do a giveaway. If I alienate anyone with being a smarty pants it'll take me that much longer to get to the magical number. Honestly I don't keep tabs on the numbers or my stats usually but someone pointed it out to me and I got pretty excited. Who would have thought that there are 198 people out there that read my rantings and ravings and misadventures. If you've hit the follow button by mistake and don't know how to un-follow can you not google the tutorial until I get to 201 because I haven't done a give away in ages. Thanks. I worked on a few quilts this week, too fickle to stick to one project again. I made two lots of binding and a certain quilt got lots more blocks done. It's starting to look like a rainbow exploded in my sewing room. I'm still not doing 15 minutes every single day but that's the way I roll. Some days are diamonds where I'm full of energy and some days I'm ready to go to sleep at around 3.30pm , which is unfortunate since I work until 5.00. I ignored two quilts totally this week. Eventually they stomped off to the cupboard in a huff and I'm sure I can hear them crying occasionally. It's a good thing there are no laws for quilt abuse. I'd have the department of quilting on my door step demanding I hand over my quilts so they can go live with someone who doesn't practice quilting neglect. Yeah ...well...I made this over the weekend. That's number 7 just waiting to be quilted. When I knock this off I'm back to 6 . This is a gift for my fur brother Hamish. As far as I'm concerned dogs need pretty quilts as much as people in the Pyjamas family. In other news, I got lovely mail again late last week . Michelle sent me my first lot of begged for selvages and managed to trip and stuff the postal bag with a whole load of other things. You have to watch Michelle because she'll pretend to want your address so she can send you selvages while in reality she's trying to do a sneaky and is plotting all along to send you a birthday present. Little P adored the Babushka bag and wouldn't leave the "happy lady" alone. And Elizabeth always knows the way straight to my heart. Birthday Sugar. Oh and a gorgeous hand made notebook that I don't want to use because it's so pretty. I think I'll just put it somewhere I can stare at it. Thank you both for your surprises. My youngest nephew pretty much cleaned me out of Oreo's last night. I think he was going for the world record for eating the single biggest number in one sitting. Eventually I hid one pack for myself while fending him off with a few well placed ninja kicks. This is the same kid that considers his greatest achievement in life thus far is the ability to not shower for 17 days straight. If only he would use his talents for good and not evil. Sigh. 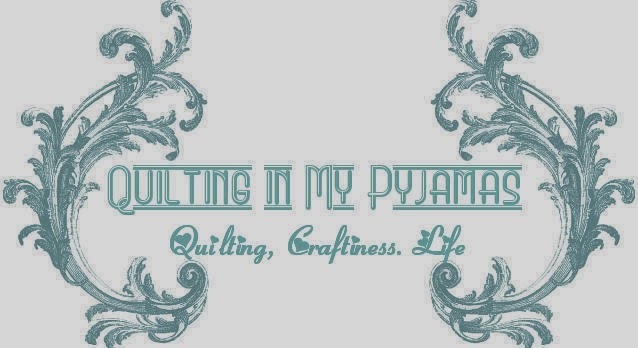 For more classy, crafty and sewing filled posts pop on over and visit Kate. Please brag! I love to see what you've done! It flabbergast me the amount of sewing you are able to accomplish, but it's something to aspire to. I love the colorful quilt!!! Beautiful! I don't want to offer competition because I really should be ashamed, but I'm pretty sure I'm a contender in the most Oreos eaten in one sitting category! You should have hid the Oreos before your nephew came over!! I always love the pics! That triangle-y thing you whipped out is gorgeous! Great job, Shay! I think I need to try this 15 min./day thingy.. I might accomplish more! I almost wish I wasn't a follower so I could tip you over to 200. Love Hamish's quilt, very pretty. He'll be the envy of all the dogs in the neighborhood. Looks like you had another week of crafty goodness. Thanks for linking up. I would love to see all your pictures .. what a great week you had. Can you come and sew at my house? I need to get to work .. how fun that Michelle was sneaky and the oreos. yum. Is it wrong that I am jealous of your dog right now? Glad to hear you think the fur persons require quilts too!! Love those bright colours. Love the Spanish subtitle on your Oreos....I was looking at the Halloween ones the other day at the store. Quilt police only exist in your mind, I keep telling you! I want video of the ninja kicks. I love Hamish's Quilt!! I wouldn't mind eating all your Oreo's!! You'll be at 200 in no time!! Don't get giving it to a dog at all but love that top. So bright and fun. Love Hamish's quilt! You constantly amaze me with how much you get done - must be all that sugar! I can not believe you didn't hide the Oreos! Serious mistake!!!! Hamish is one very lucky dog, love his quilt. Can you please send a teensy weeny bit of that energy this way. I could do with some of your productivity. Love the fur babies quilt. Rachael sent me Lucy's quilt so it doesn't get lost overseas and it is totally gorgeous!! So cute, and I love your label on the back did you get those made or do it up yourself? Brag away! If it is any consolation, I have twelve sewing WIPs and two knitting WIPS. You deserve to brag! I'm so trying to get something done these days, nothing so far, so brag girl! My dog and his friend have quilts too, saves the sofas a bit. I too don't follow who reads and who doesn't but looked at stats one day after being told where that button was and couldn't believe that so many people read our little conversations! I'm not telling you how many WIP'S I have!! You might come after me with ninja kicks!! Lucky dog! And where are those last 2 followers - I am anxious for a Mrs. P Giveaway! Nearly 200 followers- how fantastic! You are so entertaining you know. We love to hear you show off all the fantastic stuff you do so don't hold back. We're all sitting here waiting to see it all. you're a very generous aunt, let me tell ya! how fun that you were surprised twice in one week! There may be no laws against quilt abuse, but there are support groups for the quilts. I should probably get your quilts in contact with those groups. Poor things. Love the gifts especially the cookies. The a really nice quilt you made for your fur brother. I'd say he's very lucky! Now your Fur 'brother' will think it is always daytime with that bright colourful quilt. Hope you have plenty of playtime left. Lucky you getting all those pretties - hope you get started on Michelles stitchery soon.